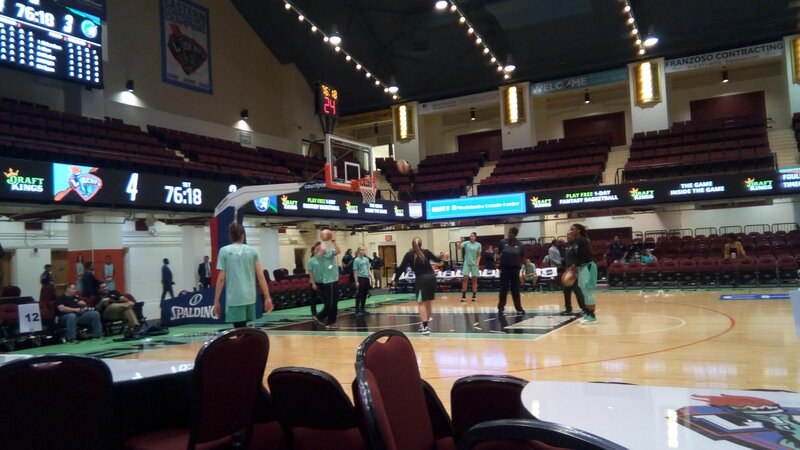 For most of their years, the New York Liberty played home games in Madison Square Garden in Manhattan – one of the basketball meccas of the world. 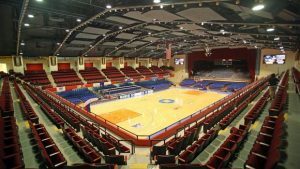 This season, Madison Square Garden moved the team to the Westchester County Center in White Plains, N.Y., and the difference is striking. Imagine driving a Mercedes for years, then being forced to switch to a used Honda Civic. In contrast, the Westchester County Center seats just 2,319 fans. This year’s home opener was a sellout, but attendance for the second game was far less than 2,000. Even if the team were to sell out all remaining home games, they would draw 128,000 fewer fans than a year ago. With tickets averaging under $20.00, there is no way this can be a profitable enterprise. Two contests this season will be played at the Garden. The first was this week – a Tuesday morning game with an 11 a.m. start. Attendance was 7,215, despite the time and day. 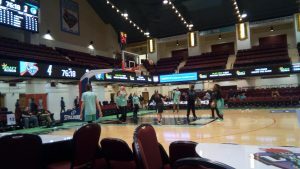 Undoubtedly this was due to reuniting the team with its longtime fan base, as Westchester is a long way from downtown New York City. Liberty players at shootaround at Westchester County Center. Photo by Jim Clark. Of course, the owners of the Liberty don’t seem to care anymore. MSG executive Chairman James Dolan has never liked the team. It fact, it isn’t clear that he wants to own any sports teams. 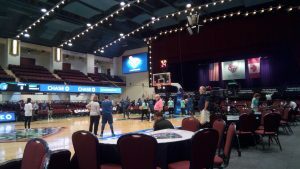 Management claims the Liberty has always lost money, and Dolan announced last November that the franchise is for sale. The move out of the Garden to Westchester happened shortly after the announcement. No sale is pending, though a handful of parties are rumored to be interested. So where does that leave the Liberty players and coaches? Putting the best spin on the situation, and doing their best to play through it. Coach Katie Smith was optimistic on opening night. 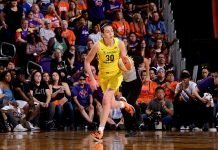 Rookie Kia Nurse remained upbeat about the venue. The general reaction of the press to the new venue, however, was disdain. Many disparaged the high school gym feel, and the depressing aura of the tiny, aging, arena. But what about the fans? Minnesota players warm up prior to their match up with the Liberty. Photo by Jim Clark. I took a very unscientific survey of people sitting in the season ticket section behind the benches, talking with about a dozen people at the Liberty’s second game at the venue. Generally, fans liked the intimacy that the closeness of the seats to the court provided, as no seat is more than 65 feet from the playing surface. More than half were excited that the team was in Westchester County, which was close to their homes. Angela, in her late 20s was there with her sister. “It’s very family oriented here,” she said. But she lives just five miles from the arena. Frank lives in Westchester, but had been to Liberty games at the Garden. Unfortunately for the future of the team, however, I was able to find just one person who had been a Liberty season ticket holder in New York. Ken Caudle received an award from the team for being a season fan for all 22 years of Liberty play. He’s from the Bronx, which puts him just about halfway between the Garden and the Center. 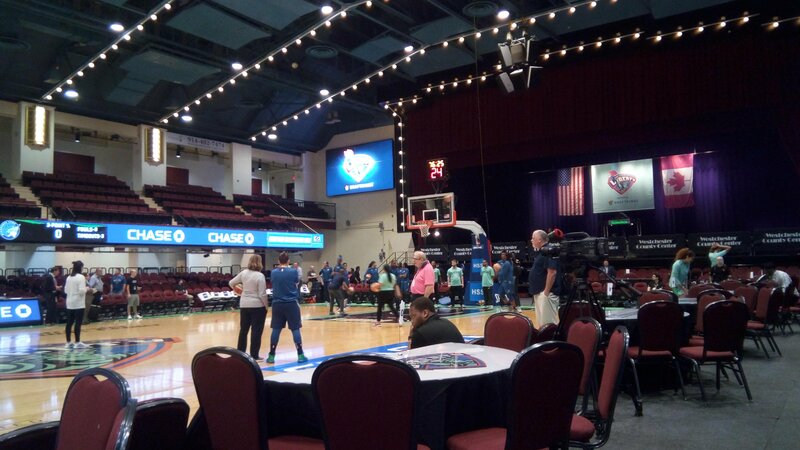 To be sure, the Liberty’s brand new fan base is right on top of the game at the Westchester County Center. The crowds can hear the players communicating on the court. It may be a lot more accessible, like that used Honda. But the venue has no class, no history, no celebrities, no cachet, and no future. I fear it may be where James Dolan has sent his step-child sports franchise to die.